ACs will always win their battles against the fans. Fans are limited by their capacity of utilizing electricity, features, size, and the motors. Take the tower fans for an example. These things are hardly comparable to Air Conditioners in terms of performance. Yet, I’m dedicating this article to these machines. The best tower fans are great addition to your house. They have an aesthetic value and add to the beauty of the living space. These things often imitate ACs to the best of their abilities. Test enough devices and you’ll find out that these things are adapt at their job of cooling the room. Some of them monitor the temperature, deliver automatic cooling, variable levels of speed, and a handy night light. They do that while not being an eyesore and costing us a fraction of a full-blown AC. To answer your questions: Right here, in this article. Look through this piece to find one that best suits your needs. If you’re looking to do your own thing, read my buying guide and ride off to the sunset to find the ideal match. Okay, these things are available by the numbers for people to buy. I understand if someone pushes the wrong button looking at the wrong product. You might think something is right for you but may turn out to be a bummer. That’s why you’ll see so many articles with the top tower fan choices. I thought I might join the party as well. So, here’s my list. We all have done it at least once, yes you know what I am about to say. We have all lost a lot of energy and time trying to decide which tower fan to buy. Don’t worry, the purpose is not to make you upset, I just want to give you a heads up on a hot new product that has hit the market. Yup, I’m talking about the Lasko 2551 Wind Curve Tower Fan. A common question for you might be, why this fan over the others? You might have seen a ton of tower fan reviews but this one is worth looking at particularly for its literally mind-blowing features. Got you smiling? Hold on to your seats because this baby is big. And when I say big, I mean 42.5 Inches to be exact. For the features, it has three quiet speeds that come with widespread. If maximum air delivery is needed, oscillation is an option with a small footprint that will help you optimize space. The design is absolutely stunning. The curved design and brushed metal accents are meant to impress. So, at the end of the day, you get extra comfort with refreshing air that comes with style. Plus, this knows what’s good for itself and you, it shuts down after 7.5 hours of runtime. The electronic controls and the remote are pretty handy to use. The customizable options are too many to cover in this small bit of review. Lasko 2551 makes little noise when its running. I’ve calculated it to be 67 dBA. This is just a bit louder than the sound of average human conversation. Chances are, you’ll not hear the fan operating at all. It ensures safety with a fuse. Whenever there’s an overloading, the fan shuts down immediately. To make the deal even sweeter, it comes with a one-year warranty. If something goes wrong, the makers have your backs. You don’t need to keep any doubts about the quality of the device in your mind. Lasko 2551 is designed and engineered in the US. This is one of the simplest fans to wrap your heads around when operating. This is a quiet tower fan if there ever was one. The sound it makes is 67 dBA only! To assure the user remains safe, it has a protection plug that guards against voltage flux. You have an option to set it to an automatic mode that runs for 7.5 hours maximum. Remote control is my personal favorite. It makes handling this baby a lot easier than you think. I must say, I found the remote’s range to be a bit shorter than what I’d have liked. The ionizer light can too bright for some people to ignore and fall asleep at night. A fan of air multiplier technology? Look no further as Dyson brings you it’s finest in the batch. The Dyson 63456-01 Air Multiplier AM07 Tower Fan does it all while being friendly with your wallet. When we buy an electronic device, we expect it to last. And a sleep timer is just what you need to keep this fan running for years. The design makes it a good candidate to stay damage-free most of the times. This astounding machine is capable of creating uninterrupted airflow. You get to have all the benefits of a tower fan without the risk of those fast-spinning blades. Yes, it’s bladeless. This means you can have a nice afternoon nap knowing that your pet and kids are all safe and sound. A common problem we all face from tower fans is the functionality of the remote. Either it gets too complicated or it becomes totally ineffective. If you want simplicity with variety, well this is your lucky read, as this fan has a remote that allows you to surf through ten precise airflow settings. Then comes the common terror of losing the remote. Those days are well in the past as this fan’s remote comes with a curved magnetized design which will easily set itself with the fan. There is a reason Dyson fans are popular. Because they prioritize safety and ease over all else. So, when you get to cleaning it, you will get it done fast and easy. There are no tight corners or messy design issues. If you want to save time cleaning your appliances, you won’t regret checking this out. Want to sleep peacefully? This little fan can keep circulating air while you take an afternoon nap or a night time sleep. Just set the sleep timer to the required time you need it to run and you are good to go. You can set it from 15 minutes to a maximum of 9 hours. More fun than a hassle right? Portability is one thing Dyson is also good at. The fan weighs only six pounds. One can pick it up and move from room to room easily and without any complications. This is a bladeless fan; one can expect it to be very quiet when operating. Even in indoors. The sleep timer of this fan can keep it running for as long as 9 hours. Enjoy your resting time. One can clean it thoroughly and safely as well. This is thanks to the bladeless design it has. Again. This thing is a bladeless fan. It’s bound to be quieter than any tower fan with blades. One has as many as 10 airflow settings to choose from using the interactive remote of this fan. People will have to deal with a steep price if they want to buy Dyson 63456-01 air multiplier fan. You want Oscillation? You got it! In fact, this fan oscillates for up to 90 degrees. Sound good? Wait, there’s more. If you have gone through various consumer reviews out there you will find that this one will climb on the top few of the best tower fan list out there. The assembly can be done in almost no time at all. Making the fan a user-friendly device is at the top of the makers’ list. One might miss the common timer feature on the remote, but this one issue can be overlooked because a reliable solid product is hard to find. Don’t take my words for it, check out the features that this one is loaded up with. Heavy on the assets and light on the pocket is how Honeywell likes to flow. Got a big bedroom and don’t know how to air cool it properly? Then I assure you, you are reading the right article. Cool uninterrupted airflow in a large room with the king bed is a must for a good night sleep. The quiet mode will provide just that with almost pin drop silence. The remote is not complicated at all and is simple to use and there is little need to see the manual when it comes to operating the fan. The mid-range remote is very handy when you are spending those lazy weekend afternoons in bed. Furthermore, the remote sits perfectly within the body of this tower fan. One doesn’t have to find a separate place to store it. This lessens the chance to lose the remote somewhere when we need it the most. One has as many as 8 speed levels to play with when covering the room with this fan. So, I’m not worried about performance when it comes to Honeywell HYF290B. To broaden the smile on your face further, this product is equipped with solenoid controls that should make usage a whole lot easier. When I say this thing is quiet, I mean it. You will find that Honeywell HYF290B making 48 dB of sound when in operation. You can’t find too many fans quieter than that. This is a user-friendly device that can be assembled in quick time (quicker than easier). Solenoid controls are a step up than traditional versions where the response time is shorter. This is one fan that’s made for a large room. People can use this across a king sized bed in their master bedrooms. I’ll take a 90-degree oscillating fan any day of the week to cover every corner of my room. 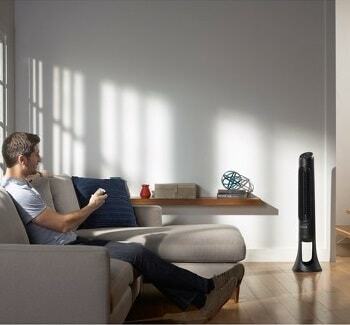 8 different speed levels and a handy remote is all one needs for a tower fan to cover a big room. Even with 8 levels of speed, the air output can be a bit on the downside for some of the users. This fan by Lasko is a lean and mean air-cooling machine! I mean just look at this beast. With this remarkable tower fan, you get an ionizer to make sure the air circulating around you is pure. This is thanks to the ionizer that comes with Lasko T48310 Xtra Tower Fan. Thanks to the ionizer, this fan cleans the air it delivers and protects you from allergic particles. 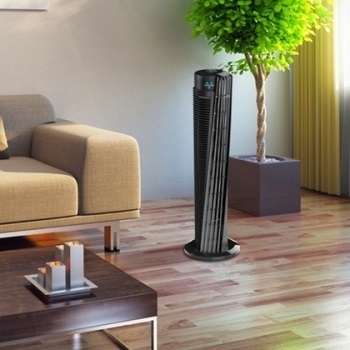 Breathe easy and feel easy as you know you are cool in a healthy environment with your Lasko tower fan. If it still doesn’t sound enough then hold your horses, because you get even more. The design has a sleek and modern feel to it. Seeing it up front will make you realize that this is not only a tower fan but an aesthetic asset to your home as well. Lasko is known for its three-level speed control. that will allow you to choose the airflow of your need. It’s as the say, there’s a speed for every occasion. Even on the lowest setting, this fan can pack a punch, 680 CFM to be exact. This can increase to 867 CFM which is more than enough to cool a large room easily. However, this piece of tech can be a bit noisy when someone operates it at a high speed. The performance cannot be questioned of this big gun as it is 48 inches tall and 13 inches wide/long. It might be twelve pounds but can be repositioned easily and be kept above the floor as a floor fan. 90-degree oscillation is a given, and it grants you a breezy cool environment across the entire room. If you want this thing to run for a long time, Lasko has you covered by giving the timer feature that will help you control the runtime of this little beast. It helps when planning a long night’s sleep or an afternoon nap. And speaking of control, you get a handy remote that will be hard to lose as there is a holder in the back of the fan to keep it in place. With the onboard controller, this remote gives you something extra to go on. 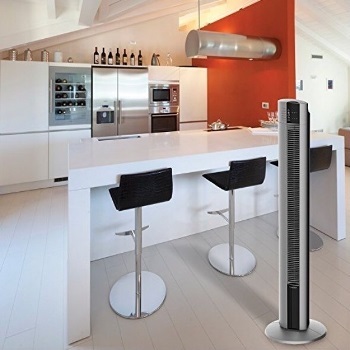 People can put the three-level speed control to good use with this Lasko ionizer fan. You have flexibility by your side with all the control options and different settings onboard. The remote is of medium range in my opinion. The fan itself is suited for medium-size rooms. One can rely on the timer on board to make sure the fan runs automatically when he/she sleeps. Lasko T48310 is portable. You have a nifty handle at the back of this fan that lets you carry it. I must admit, it is a bit noisy when someone runs the fan at a high speed. If you don’t mind a bit of extra sound with a hell of a lot more airflow, well Lasko brings just the thing for you. 30 percent more efficiency with the features that are enough to blow the competition out of the wind. Without further introductions, let’s get into what this machine is capable of. Installment and mobility are a total breeze. There are integrated handles in this thing that will help you move it around wherever you want to. For a 13-pound fan, this feature was a must. And 40 inches of size is nothing to joke around about. Lasko doesn’t usually hold back when it comes to necessary features. When it comes to Lasko 4443 fan, you get an ionizer to keep the air clean and a timer that will assist you in increasing the lifetime by controlling the active hours of the fan. Of course, people have the convenience of a simple control panel. On top of that, you get a remote too. The interactive controls feature “Speed Control” switches, Oscillation, On/Off and more options. Oh, and this thing oscillates. 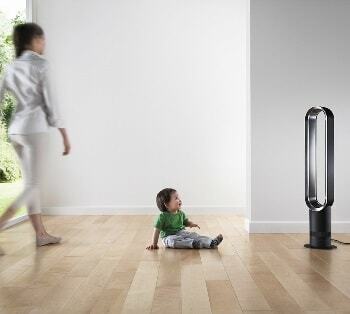 Lasko hybrid can oscillate in each direction for up to 60 degrees. But you cannot move the air direction upwards or downwards for that matter. Don’t worry about voltage surges. This is a safe device to use. You have the famous blue plug. It cuts off electricity even if it sniffs slightest bit of danger to this fan. Now comes the interesting nightlight feature. A late-night drowsy walk to the fridge might get pretty nasty if you bump into a heavy fan like this one. To make sure it doesn’t happen, there is a glowing light installed that will let you see the fan’s position. It won’t be very painful for the eyes as it is dim and puts little pressure on your field of vision. This fan cools the room in little time and is aesthetically modern. You can pick this fan over the others if you prioritize air cooling above other things, like silent operation. Overall this product is not far off from a masterpiece. I love how simple the controls of this device are. You have well-defined buttons for each function. You’ll fall in love with the remote of this hybrid fan. It gives people range and mobility. Just to make sure you don’t forget where the fan is at night, you’ve got a glowing LED light signal. This thing is a modern device. It will occupy less of a space in most houses while complementing them. The ionizer ensures that we have pure air to breath and immerse ourselves into everytime. One cannot move the direction of the air up or downwards. If you are looking for the best tower fan out there, this machine is capable of creating a storm that will crush the competition. Vornado is very well known for its V-Flow technology that is more than effective to provide airflow throughout the room no matter how large the room might be. You might be curious about the punch this thing packs. Well, the motor is capable of a higher volume of air in large spaces up to 500 cu ft. per minute. And surprisingly it pushes air up to 100 feet! It is designed in a particular crosscut outlet. This feature allows the fan to spread air in a wide span. This makes oscillation seem like a thing of the past as it covers the entirety of the area with circular airflow. So, this means less wobbling and a firm base that will guarantee quiet functionality. Being a control freak is very common when it comes to the tower fan that you bought with your own money. So, it gives you four levels of intensity control and an LED indicated timer that will allow you to control the longevity of the fan’s activity to your sweet will. Feeling a bit choosy about warranty periods is natural. Vornado values your investment and provides a 5-year long warranty on this product. Sounds good enough I know. It sounds even better when it is certified to be US voltage ready and loaded beforehand. This fan will easily make your checklist of must buy products in the future as it is safe, effective and properly priced. This is a small fan but packs a big punch in terms of power. Vernado comes with a strong motor. The Vortex Technology allows for this fan to utilize little electricity to funnel maximum output. I like the 5-year warranty period Vernado provides to the users for damage protection. It doesn’t oscillate but Vernado’s fan does move air in a circular motion to cover all areas. Vernado is quiet when it’s at work despite creating powerful gusts of air. This is one tower fan I couldn’t find any faults with. A flawless device according to me. This is not just a tower fan but it is an entire cooling package for your safe cooling and convenience. So you not only buy a big bad portable tower fan, you also get a humidifier and an evaporative cooler with the bundle. Well, this miracle machine was the finalist in the 2018 IHA Global innovation award. This bundle is capable of effectively cooling moderately sized rooms like living rooms and children’s bedrooms. Worried about your electricity bill? Does 7.5 W doesn’t sound like much does it? This portable tower fan consumes less energy and is as quiet as a sleeping baby. Silent airflow delivery is Quilo’s signature specialty. So, how quiet is it? 24dBA to be exact. If your area is low on humidity, then the humidifier will give you backup and comfort. It is up and ready for humidity up to 60 percent. Ice cold cooling in an almost lightning fast speed. This beast is packed with an ice compartment and oscillating louvers for proper and even air distribution throughout the room in no time. There is a thick honeycomb cooling pad to sustain a morning fresh air feeling and a seashore like a cool breeze. This 13-pound fan las caster wheels to make your life a lot easier as you can move it around with far less effort. The power adapter is portable and detachable too. So, when you head out for trips you can store it elsewhere and gain even more portability. The Patent-Pending Brushless technology is a whole new step towards power saving and silent functionality. The fan is ‘’Modern’’ in the fullest sense as it is packed with everything necessary without unnecessary bells and whistles. This little fan generates only 24 dBA of sound. This is super quiet compared to other products. When at work, Quilo consumes 7.5 watts of power each hour. It’s light on electric bills. This is a machine capable of handling a mid-size room without any troubles whatsoever. Quilo is a 13-pound fan but it has caster wheels to facilitate mobility. It cools your room in quick time using unique cooling pads and a patent-pending technology. This fan can present problems when you run it in weather conditions exceeding 60% humidity. Slanted fan blades that use curvature physics technology at your fingertips within an astoundingly reasonable price. This design creates accurate opposing soundwaves that reduce noise. The only thing you will hear is the soothing sound of isolated airflow ant that’s it. Ozeri being proud of its groundbreaking technology ensures 3 levels of fan speed by its triple fans that are pre-installed for 3x awesomeness. Not just that, things get cooler as you are given the liberty to control three levels of airflow at your whim. The choice that comes with effectiveness and serenity is what they wanted to give you and succeeded to quite some extent. 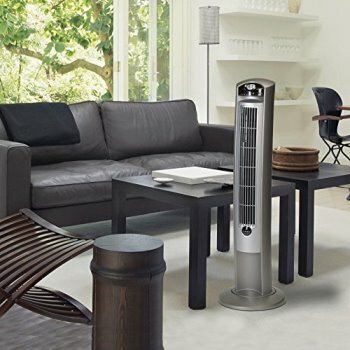 This 3x tower fan uses practically one of the world’s thinnest fan blades that make the fans less than three inches thick. Elegance comes at its finest as this fan is a treat for the eyes with a glass base that makes it no less than simply stylish. The digital look helps this tower fan to fit in with your other electronic goods just fine. The 90-degree oscillation is almost too quiet and feels close to total silence. There are three pre-programmed airflow patterns that aim to deliver comfortable modes like foster sleep and relaxation. Feel free to use the touch sensitive LED control panel you will find it very easy to operate. There is a 7.5-hour sleep timer limit that can be adjusted in any 30-minute increments. This is a piece of technology that utilizes physics, technical perfection, ease of access, and effectiveness to wow the user at a competitive price. This 44-inch fan is made for large rooms and hallways with triple fans in one package. You get to use three levels of speed and with these triple fans, the room cools down efficiently. 90-degree oscillation is just what anyone would ask for at this price. The LED control panel is based on soft touch formula and features a number of options. People get the option to put this fan on autopilot for 7.5 hours. It facilitates a good night’s sleep. This Ozeri product features the thinnest blades. Thin blades produce less sound. The construction of this fan is flimsy and it can get dents if it tips over or drops from a height. Many have claimed that this tower fan by Honeywell is probably the quietest tower fan they have owned. Ant to increase the customer attraction they have added eight variable speed modes instead of the conventional three. The best part is, even at top speed the fan seems very quiet. This makes it very appropriate for bedroom usage. The LED indicator is quite helpful as it prevents you from uncomfortable experiences of crashing into the fan while roaming around in the dark. Aside from maybe being a bit too dark, the light serves its purpose very well. But the best thing about this fan is probably the temperature control. It can adjust the airflow according to the room’s temperature. This feature is appreciated by many as it is unique and very helpful indeed. This fan has the timer feature that allows you to control when the fan should be turned off. No one wants to increase the electricity bill without reason. With seemingly moderate durability this fan is a favorite for the consumers who prefer auditory peace. The remote makes operating the fan pretty easy and it has on spot housing in the fan itself. To control the fan manually you will need to adjust it with the touch buttons. If you are on the hunt for the best tower fan out there. That is because this fan will win the competition with other brands and within Honeywell’s product range by a large margin if you prefer proper airflow in silence. I found the display system of this product to be intuitive. It even shows the current temperature. You get to use 8 different levels of speed according to your needs and current mood. LED indicator functions as a night light so that people don’t trip over this fan. Users have the option of controlling this Honeywell device through buttons or a remote. 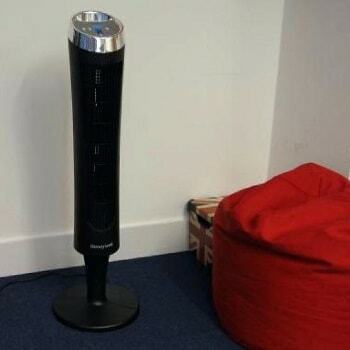 It’s a quiet fan generating white noise that helps people by putting them to sleep. One can put this fan on autopilot for 8 hours for a long night’s sleep. The fan is not that well made when it comes to the base area. One gets only three buttons with the remote control. Handling the remote takes some doing. For the reasonably low price point, this tower fan delivers what many others cannot. If you are looking for a good cooling solution for a small or mid-sized room, this Honeywell product will fit your needs. 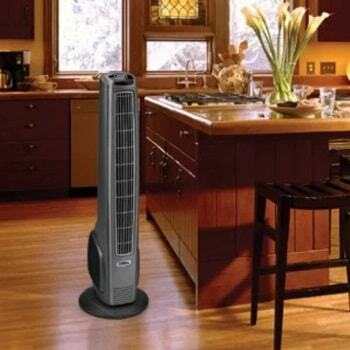 This thing has become a top-ranked tower fan in the market for its versatility and convenience. Temperature control is probably this fan’s most prominent feature. As it allows you to select between 60 degrees to 90 degrees Fahrenheit with the controls on the fan manually or with the remote with ease. The ionizer and the washable filter make the air you get as clean as it gets. Those who are concerned with health issues are bound to appreciate these assets. There is a handy breeze mode that allows the fan to switch between the speeds automatically and saves you the hassle of thinking ‘’is the wind strong enough?’’ The timer feature is extended to twelve hours max on this product which will prove to be rather unique to many customers. The five-year warranty that this product provides is another boost for the buyers. With every detail, it is getting more and more obvious why this fan is so popular among the masses. Plus, the Honeywell customer service has a very good reputation so no need to worry about replacement/ repair issues at all. It is available at two possible sizes. Both 32-inch and the 40-inch version can prove to be handy regarding your room space and cooling needs. In case you own a rather tall furniture, the 40-inch one should be preferable. I could adjust the amount of temperature I need the fan to work in. The options are 60 or 90 degrees Fahrenheit. Switch to breeze mode and this fan will automatically switch between different speeds. Depending on the room size, users can pick from two height options for the fan. People have the ionizer and a filter working together to ensure clean air for the rooms. Five-year warranty is a great boost for the user’s confidence levels when it comes to damage protection. I don’t see any problems with this device whatsoever. How Did I Choose These Models? Okay, I’ll not brag about how many models I went through before coming up with these ten choices. I already knew what I wanted from my tower fans. That’s why I judged based on these factors and did my research. As you see, these ten made my list. So, what are these “Factors?” Let’s have a look. If you are part of a modern household with a compelling aesthetic, you’d want your furniture to complement the setting. Fans are no exceptions. People should go with choices that are sleek in design and are functional. A sleek fan takes up less of a space and leaves room for you to pack in other things. This is equally true when you’re dealing with a small apartment. Saving every inch of space is vital and you NEED to opt for a stand fan that makes way for other electronic appliances in your house. Always measure your rooms and choose a device accordingly that’s efficient in cooling the space. I’d always consider how a fan performs. If it’s not cooling the room efficiently, then there’s something wrong with the choice. I’d advise my readers to count blade rpms and see to it that they buy a fan with a powerful motor. Powerful motor (like that of Vernado) will drive more air. Also, take a look at the speed settings. The more the better. Most of my choices came with three to eight-speed levels. I also included a few models that featured temperature control. These machines can cool the room accurately with this added functionality. Some of the models come with different modes. Each mode works with different energy level as well. 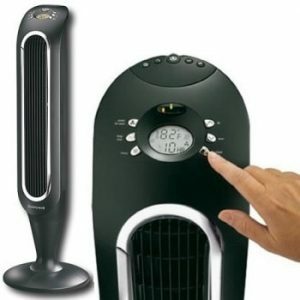 I always tell my neighbors, “You need to pay attention to the degree of oscillation as well.” It is the process through which a fan spreads air all around the room. You must’ve noticed each of my tower fan choices can move their heads from 60 to 90 degrees sideways while operating. This is the proper oscillation for me. Oscillation helps to cool the entire room within minutes. I’ve seen many people stand in front of the fan to cool down. Don’t buy such models which force you to do that. You needn’t stand in front of these machines to block the air for others. Oscillation makes the air reach you no matter which corner of the room you are sitting in. Don’t get me wrong, I am all in for a strong motor in a powerful unit which creates gusts of air. But that machine shouldn’t disrupt my day-to-day activities by awkward vibrations and noises. In fact, I prefer them quiet. A lot of my choices make so little sound that you can call them silent. People often sleep at night while keeping the fan on for the night. I know people who take afternoon naps and keep the fan running to manage the soaring temperature of the room. Without a quiet model, you’d jump in an out of your deep sleep. That’s why look for a machine that has sound muffing technology in place. I’d suggest you look at the fans from Honeywell. 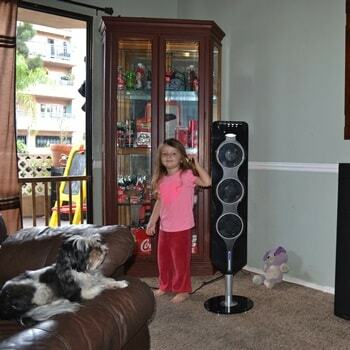 The brand brings out some of the quietest tower fans that people can buy on the market. If you want to up your game, go for the bladeless fans. These are quieter than others. First and foremost, the best tower fan choices should cool the room properly. I get that. But when choosing the ideal candidates for my list, I looked into additional perks that these machines offer. For example, some of these machines come with a large LED display. The display helps us, users, to get a sneak peak of what’s happening inside the fan and get proper readings on the situation. These LED panels serve as night lights too so that you don’t trip over the fan at the middle of a dark night. I’ve already spoken about my ideal fan having different modes. We all live in houses different in nature, shape, and size. Each room of the house is different from the other. The ideal fan should work to the best of its abilities while being in any room you put it. Different modes allow the device to suit the different rooms better in my opinion. For me, a good fan is one that has a good remote. Honestly, we all hate standing in front of our fans all day and push some buttons to get it to work in order. A functional remote with a good range takes away the hassle. One should buy a fan (like machines by Lasko) that has a conveniently sized remote with a number of tweaking options. The more the better. Also, the remote docking system should be onboard the fan. While you guys are checking through the list of features, don’t forget the “Automated Timer.” Come on! We all need a good night’s sleep. For us to wake up in every two hours and adjust the fan speed is not ideal no matter how you look at it. That’s where an “Automated Sleep Timer” comes in. Thanks to this feature, some of the devices can be put on “Autopilot” for up to 9 hours at a stretch. Fans like Honeywell Breeze can control speed levels all by itself while staying in the automated mode as well. It provides the users with just the right amount of cooling that they need at different parts of the night. It’s not a rocket science to figure out that the users need to be around a safe device. It always helps to have a mechanism that keeps your fan safe against surges of electricity. Brands like Lasko feature a blue plug that cuts power whenever there’s a threat of a voltage surge. Not all of my readers will go for Lasko tower fans, I know. That’s not a problem. Very often, the top tower fans are ETL listed. It means, they are safe to operate. Just to be safe, make sure the brand you choose has a sturdy but not metallic body. With that, electricity cannot travel through the fan. Don’t neglect the possibility of your children cutting their fingers while playing with the machine. Choose a device that has well-guarded blades. The space between different parts of the grille shouldn’t be big enough for children’s fingers to pass through. Again, bladeless fans allow for a bit more safety in this case. Let me make it clear: the tower fans you see on my list are not cheap in quality but in price. In all honesty, we’re not buying an AC here. Yes, we want to keep our household cool. But we don’t want to end up spending hundreds of dollars on a device that ill-suits our motives. That’s why, we need to evaluate our needs and preference down to a minute detail. I did that while coming up with the list and I’d advise my readers to do the same. Pay for features you need. Believe it or not, the ideal cooling device can cost people in double digits depending on what they need. Choosing the best tower fan for us is not as easy as buying candy from Mr. Wilson. But, it’s not a rocket science either. Sure, it’ll take some doing. But after writing a long guide on it, I’m sure my readers can pull it off. When in doubt, feel free to use my buying instructions as a reference.